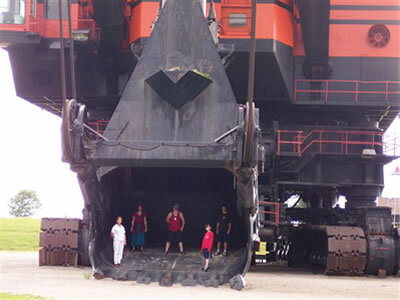 Big Brutus is a finalist for the 8 Wonders of Kansas because it is the largest electric coal shovel in the world! Looming on the horizon, one sees what appears to be a gigantic, prehistoric creature rising above the Kansas plains. Upon closer inspection, the creature turns into a black and orange, 160-foot tall coal shovel named Big Brutus. 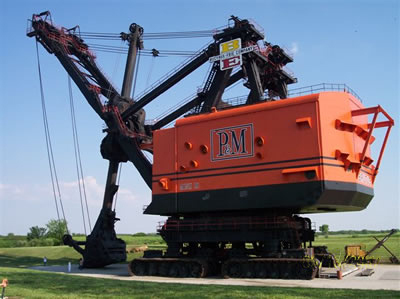 Designed and built by Bucyrus-Erie for the Pittsburg & Midway (P&M) Coal Mining Company, the 1850-B is the only one of its kind ever built and is recognized as an engineering accomplishment. Big Brutus, built near Hallowell in Cherokee County, cost $6 million. It took 150 railroad cars to bring all the parts. A three man crew ran Big Brutus with the support of electricians and roller operators. The coal shovel ran 24 hours per day, 7 days per week, from 1963 until 1974 at a speed of .22 miles per hour (less than 1/4 mile per hour) and moved approximately one square mile per year. Big Brutus did not dig coal. The huge bucket removed the overburden (dirt and rocks covering the coal seams) and with one scoop could fill three railroad cars. Huge coal strippers moved in on the coal seams after Big Brutus exposed them. In April 1974, Big Brutus dug himself out of his last pit, approximately 65 feet deep, and ceased operation. 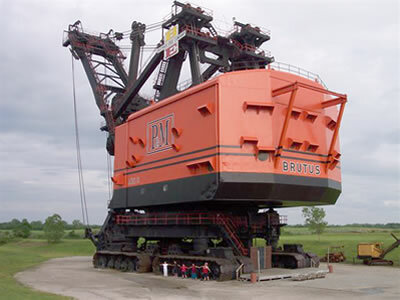 In 1984, P&M deeded Big Brutus to be used as a museum dedicated to the coal mining industry. Now visitors can sit in the operator's seat of Big Brutus and see the levers and dials that manipulated this giant. A nearby museum building helps tell the story of the mining heritage of Southeast Kansas. There was one larger electric coal shovel in Ohio until early 2007 but it, like all the others, was disassembled. Location: 7 miles north of Columbus on K-7, 6 miles west on K-102, then 1/2 mile south. Contacts: Big Brutus, Inc. 620.827.6177; bigbrutus@columbus-ks.com. Near Big Brutus is a visitor center museum. Hours and admission charge: January-March daily 10 a.m.-4 p.m.; April-Memorial Day Weekend daily 9 a.m.-5 p.m.; Memorial Day to Labor Day daily 9 a.m.-7 p.m. Labor Day until January daily 9 a.m.-5 p.m. Admission for adults (13-65) $8; senior citizens (65+) $7.50; children (6-12), $5.00. Children under five are free.